never get beyond the first syllable. I am feeling very hopeful that the United States is finally going to tackle climate change. President-Elect Obama has shown that he intends to put the full muscle of the federal government into halting, and then reversing, the greenhouse gas emissions that are, at this point, still accelerating. And not a moment too soon. The world lost eight valuable years with George Bush dithering and denying the gravity of climate change. While a great deal of damage to the planet and to many of our fellow creatures cannot be undone, I am hopeful that over the next four years we will make significant headway in averting catastrophe for the entire planet. Steven Chu, Secretary of Energy. This Nobel Prize-winning physicist takes climate change very seriously. He said recently that scientists have come to realize that the earth’s climate is more sensitive than was thought previously. The world’s other top emitter of greenhouse gases–China–has hailed the appointment of a Chinese-American to the Energy post. Chu may be uniquely suited to engage in successful negotiations with China regarding emissions reductions by our two countries. Lisa Jackson, Environmental Protection Agency (EPA) Administrator. Perhaps the most controversial of Obama’s environmental picks, Jackson has been praised for her leadership on climate change in her role as New Jersey’s chief environmental regulator. She is known for pragmatic approaches, some of which have angered environmentalists, others of which have angered industry. She is expected to act aggressively on climate change in her new federal position. Nancy Sutley, chief, Council on Environmental Quality. She is an expert on climate, energy, and air policies and has worked at the local, state, and federal levels. The Natural Resources Defense Council (NRDC) praises her extensive political skills. Carol Browner, Energy Tsar. In creating this new position, Obama has underscored his position that clean energy and climate protection are keys to spurring economic recovery, while safeguarding the planet, according to NRDC. Browner, EPA Administrator during the Clinton years, was given high marks for her efforts to protect environmental rules from Newt Gingrich and the GOP, who were trying to dismantle them, en masse. Browner’s role as ‘Tsar’ will be to coordinate energy and environmental policy among the myriad federal agencies and to head a National Energy Council. The More I Learn About the World. . . .
“The more I learn about the world, the better my interactions with it will be. “Education is our first step toward improving all our actions. Whether we learn from courses, books, experiences, or other people, everything we learn can help us improve the world and our effects on it. Whether we learn individually or collectively, all learning helps stretch humanity beyond its past mistakes. Great news! Eastern Egg Rock, in Maine’s Muscongus Bay, is once again home to nesting puffins. The funny-looking, penguin-like birds who once lived there in large numbers, had been all but wiped out by the early 1900s. Prized for their meat, eggs, and feathers, they had been hunted so extensively that they disappeared from the eastern United States. Enter Steve Kress, an Audubon scientist. In 1973 he launched Project Puffin, the world’s first seabird colony restoration project. 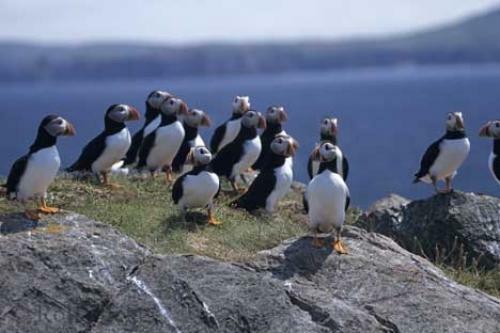 For 13 years, Kress and his team transplanted almost 1,000 young puffins from Newfoundland’s abundant population to Eastern Egg Rock, in hopes that the birds would thrive and establish a colony there, where their ancestors had once lived. Kress and his crew helped the puffin chicks survive by digging burrows for them on the island and by bringing them fish to eat. Once the first group of chicks matured and left the island, Kress waited excitedly. Knowing that puffins typically return to nest where they spent their ‘childhood,’ he hoped that these resettled chicks would come back to Eastern Egg Rock when it was time for them to nest. And they did! With 2008 drawing to a close, I am feeling grateful for many things. One of the greatest blessings of the year for me has been www.TheEarthConnection.org. I am especially grateful to my husband Andy Schmookler for conceiving the idea of this site in the first place. And I am thankful for his encouragement throughout the process of creation; there were many moments when I wondered if I, a bumbling technophobe, had what it takes to manage a website! www.TheEarthConnection.org means a great deal to me. Knowing that there are people who are interested in my postings has been heartening. As you well know, the earth is my passion. The joy I derive from the natural world is deep, and so is the pain I feel whenever I see, or learn more about, the destruction we humans are wreaking on it. This web site is a rich and wonderful opportunity for me to share with others my delight, my hope, my learning, and my natural bent toward activism. The site has been a means for me to live more from the part of me that is deeply connected with nature, the part that loves that connection. I thank you for reading my postings. And an extra thanks to those who have taken the trouble to comment from time to time. This website has yielded an unexpected benefit. I am finding an artist stirring in me. I see that I am noticing more when I am outside, or even when I look out the window. Ideas pop into my head for words to describe my experience, words that feel true and pleasing to me. The knowledge that people will be reading my postings is a fine muse! Now for my request. I am eager to get this website out into the world more widely. My request for a ‘Christmas present’ is that you, if you feel happy to do so, share www.TheEarthConnection.org with two people in your life who, you think, might find the site of value to them. I thank you in advance! When it comes to packaging gifts this season, you can do the earth and wildlife a favor by avoiding Styrofoam. While those little ‘peanuts’ may be good for protecting breakables in the mail, Styrofoam–or polystyrene–poses major problems. Pieces of it can end up in rivers and oceans, where birds and other animals often mistake the light, floating plastic for food. Polystyrene is bad for us too. Its components can alter DNA structure, damage the nervous system, and may even cause cancer. So if you’re thinking of purchasing a bag of polystyrene peanuts to protect the fragile gifts you’re giving, please rethink the idea. Perfectly adequate alternatives include: wadded up newspaper; popcorn (real popcorn, that is, preferably unsalted and unbuttered); crumpled up plastic or paper bags; even rags or old towels. And what to do with the polystyrene peanuts that accompany gifts you receive this holiday season? One approach is to carefully gather all the peanuts into a container, and then reuse them the next time you have a package to mail. As soon as I looked outside this morning, through the small space between the curtain and the edge of the glass door by our bed, I knew I was in for a treat. The few small branches I could see were encased in ice. But I would have to move fast; I knew from experience that the sparkling wonderland the woods had become would soon melt away. Taking time only to dress and to tend our two woodstoves, I dashed out. Hearing what sounded like a steady rain, I knew I had already missed the ice-enveloped scene at its peak. What sounded like rain was instead water dripping from hundreds–thousands–of branches, twigs, and berries, as the warming morning released them from their icy embrace. To walk beneath a tree was to be ‘rained’ on. Walking from the front door to our driveway meant stooping to pass beneath a new, temporary arch. The slender holly tree that usually stands upright next to the house was bent over, under the weight of the ice that outlined its branches. As I moved farther up the driveway, the stalks of bamboo growing at the driveway’s edge were bent far over, many of them resting on the driveway. While I could lift the bamboo stalks only with difficulty, I knew that they would begin to straighten as the ice melted, and before long they would completely resume their usual posture. I had to visit the deeper forest while this transformation lasted. So down the side of the ridge I walked, marveling as I went. Now at the corkscrew willow branch resting on the ground, its curling twigs made all the more vivid by their frame of ice. Now at the graceful little dogwood, its red berries shining all the brighter from within their glassy coatings. And now at the red maple, always pleasing in the spare, curved line of its trunk, today looking even more elegant under its low, wide crown glistening with ice. Once I descended a little farther, I saw a dramatic scene. The little white pine saplings that dot an open area were all bowed reverently, their tops touching the ground. These tiny bending figures immediately brought to mind the Muslim children I taught several years ago, who prayed every day, with their heads to the ground. Unlike the children, however, the bowed pines did not all face Mecca. After some time in the forest, I climbed the steep hill to the top of the ridge and followed the dirt road that runs along it. What a pleasure to look out to the east on such a morning. Hills, some near, some far, and others in-between, were interspersed with misty clouds. As in a Chinese painting, the hills were softened, made more mysterious by the mists that partially obscured their shapes. “They may not be cute and cuddly, but rats have become man’s new best friend, says The Boston Globe. “Because they spend their lives foraging for food, rats have supersensitive noses, which scientists have learned to utilize in two new lifesaving projects in Africa. “In Mozambique, giant rats have been trained to sniff out thousands of land mines left from pervious conflicts. The rats’ “noses are far more sensitive than all current mechanical vapor detectors,” says Harvard Bach, a mine-clearing specialist with an international aid organization. Europe, where millions of mines that remain buried from previous wars kill and maim thousands of people each year. “In Tanznia, the rat’s sense of smell is being used as a medical testing device: they sniff saliva samples for traces of tuberculosis. The animals are able to identify early-stage infections that may not be found by a microscope. “Rats get a bad rap, says Alberto Jorge Chambe, a rat handler for the Mozambique project, but they’re smarter and friendlier than you might think–and far less expensive than trained dogs. This fairly long poem, by the nineteenth century American poet William Cullen Bryant, is full of strong, vivid images of winter beauty. Feared not the piercing spirit of the North. Of winter blast, to shake them from their hold. That stream with rainbow radiance as they move. Shall close o’er the brown woods as it was wont. Of blossoms and green leaves is yet afar. Shall buffet the vexed forest in his rage. This Christmas, my friend Jeanne Russell is giving gifts that may go on giving for years to come–to her loved ones who receive the gifts, and to the earth as well. At the same time, Jeanne’s gifts will save their recipients substantial sums of money, leaving more ’green’ in their pockets. So what is Jeanne giving? Everyone on her list will receive a small bucket of some of Jeanne’s favorite earth-friendly household cleaners, along with a book of recipes for scores more cleaners designed to meet just about every household cleaning need. Having grown concerned that the many toxic ingredients contained in a wide range of commercial household cleaners may be adversely affecting her and her son, and the planet too, Jeanne set out to learn how she could clean her home without exposing herself and her son to harmful chemicals and without sending harmful chemical residues into the environment. Jeanne went online, found and bought Karyn Siegel-Maier’s The Naturally Green Home, a veritable ‘cookbook’ of recipes for cleaners that will clean appliances, laundry, grease- or wine-spattered surfaces, toilets, tile floors, mirrors and windows, and much more. Jeanne has tried quite a few of the book’s recipes, and she’s sold on them. “Not only are these cleaners effective,” she explains, “but they are cheap too.” By stocking up on such readily available items as white vinegar, Borax, baking soda, and Murphy’s Oil soap, she has most of what she needs to prepare the various cleaners. Some of them also call for other ingredients that Jeanne can usually find in a health food store. “Then there’s the special ingredient,” Jeanne notes, “the essential oil.” Most of the book’s recipes call for just a few drops of peppermint, lavender, citrus, or other oil. In addition to giving her cleaning concoctions an inviting smell, the essential oils also have anti-fungal, anti-bacterial, or anti-viral properties, Jeanne explains. “Citrus oils, for example, are especially good at cutting grease,” she says. Combine all ingredients in a large glass or heavy plastic container. Shake. Use 1/4-1/3 cup with a load of laundry. Mix ingredients in a spray bottle. Shake before using. Spray surface and wipe dry with a damp cloth. Mix ingredients in a spray bottle. Shake and spray. Wipe dry with a clean cloth. You are currently browsing the Earth Connection blog archives for December, 2008.